Today’s spiritual landscape is littered with churches on their last legs, forcing us to reconsider how we keep the Body of Christ alive and strong. The solution, according to visionary pastors Darrin Patrick and Mark DeVine, is to infuse new blood into the body and by seeking God’s presence and guidance. 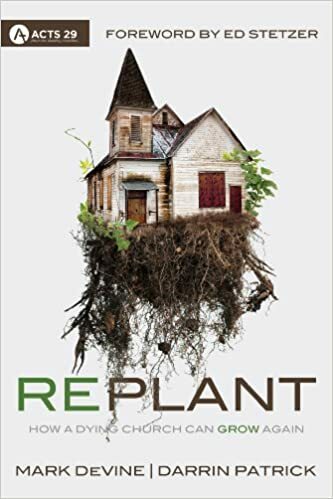 Avoiding cookie-cutter steps or how-to formulas, Replant describes the story of a church resurrection, a story that offers a multitude of divinely inspired, and practical possibilities for church planters. The result is a harvest of inspiring ideas on how to inspire new church growth. Discover a new openness to churches merging with other congregations, changing leadership, and harvesting fresh spiritual fruit—inviting us all to re-think how churches not only survive, but thrive. Darrin Patrick is pastor of the Journey, a church he founded in 2002 in the urban core of St. Louis, Missouri. Darrin is vice president of the Acts 29 Church Planting Network. He also serves as the chaplain of the St. Louis Cardinals. He earned his doctorate of ministry from Covenant Seminary and has written three books, including The Dude’s Guide to Manhood, Church Planter, and For the City. Mark DeVine is a professor at Beeson Divinity School in Birmingham, Alabama. He has taught at Midwestern Baptist Theological Seminary in Kansas City and also served as a missionary in Bangkok, Thailand. Mark has pastored churches in five states and speaks regularly at conferences around the world.